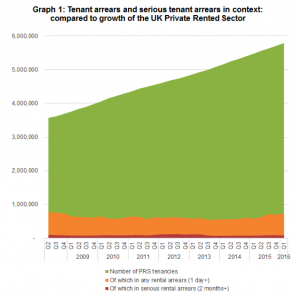 Bearing in mind that the number of tenanted homes has grown from 3.6 million households in Q2 2008 to 5.8 million today, an increase of 68%, the fall in arrears is remarkable. Clearly, the healthier job market plays a key part in the reduction of arrears, as does relative affordability as a result of the huge increase of available rental homes. However, it mustn’t be forgotten that landlords have become significantly more professional over time and whilst the crisis of 2008 led to many accidental landlords, unable to sell their properties, many are now a great deal more savvy, taking advice from experts like SLC Solicitors in the field of debt recovery which has ameliorated the arrears situation. This improving arrears picture has had the effect of significantly improving the finances of BTL investors with a reduction of mortgage arrears down to just 9,300 cases of arrears of more than 3 months. 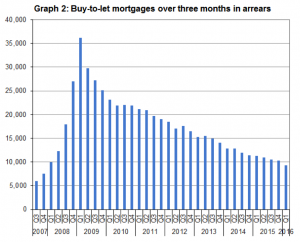 Despite the huge growth in BTL mortgages, the number of mortgage arrears has not been lower since 2007. The good news continues with a fall in Q1 2016 of 26,230 county court orders in England and Wales made for eviction, down from 26,964 in Q4 2015. However, all is not rosy in the garden and government policy is due to bite with the removal of mortgage relief and automatic 10% wear and tear relief. This may not affect small landlords too badly, but those who have sought to make a living from BTL will be impacted and this may lead to less healthy landlord finances. Adrian Gill , Executive Director, Estate Agency, LSL Property Services PLC commented: “Looking ahead, the next hurdle put up by the Government will be the coming changes to the tax relief of mortgage interest. For many smaller landlords and for those without significant external income, the phasing out of tax allowances at the higher rate could be minimal if they don’t fall near the higher tax bands in the first place. But professional landlords with more than a couple of properties could be hit harder. “Regardless of their situation all landlords should know where they stand – with a revised plan and the proper advice to make sure they can continue to operate successfully under the new rules. Jo Green of SLC Solicitors commented: It’s great news for the sector, and our clients in particular, that arrears have come down. But it’s important notSo, whilst all is well for now, it pays to look ahead and plan for the future. As Government policy starts to bite it will be crucial for landlords to keep a tight rein on their finances. A proper strategy for debt recovery is paramount. to become complacent. Our experience shows that depth of arrears is cyclical, and whilst our clients are enjoying a period of stability and profitability, the market can change very quickly. Fortunately SLC are extremely ‘market agile’ and can deal with fluctuating markets rapidly. I would echo Adrian Gill’s comments to take professional advice at an early stage.